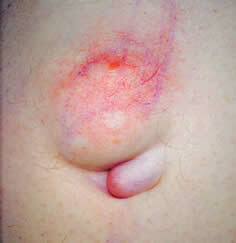 Ventral hernias are hernias anywhere along the anterior abdominal wall other than the naval area. A hernia that appears at the site of a previous surgery is known as an incisional hernia. These incisional hernias can appear weeks, months, or even years after surgery and can vary in size from small to very large and complex. 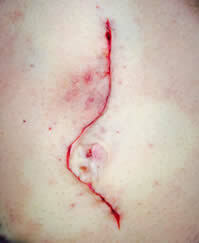 These type of hernias can be repaired without mesh using a three layered suture technique that is patent pending by Dr. Robert Tomas or with a biologic mesh. If you think you have a ventral hernia or an incisional hernia it’s important to see your doctor because it may widen and become extremely difficult to repair. 56 year old male who complained of a bulge at the level of the umbilicus (navel) and a second bulge above the navel for four years. He wished to have it repaired with no mesh. 2. Welty G, Klinge U, Klosterhalfen B, Kasperk R, Schumpelick V. Functional impairment and complaints following incisional hernia repair with different polypropylene meshes. Hernia. 2001;5:142-147. 3. Harrell AG, Novitsky YW, Cristiano JA, et al. Prospective histologic evaluation of intra-abdominal prosthetics four months after implantation in a rabbit model. Surg Endosc. 2007;21:1170-1174.